most used for coliforms identification. Hydrochloric acid (conc.) ..................................................................................... 250 ml. 2. Margaret Barnett, 1992. Microbiology Laboratory Exercises. Wm. C. Brown Publishers. 3. Standards Unit, Microbiology Services, PHE. UK Standards for Microbiology Investigations. Identification of Clostridium species. Bacteriology – Identification, ID 8, Issue no: 4, Issue date: 12.01.15.
surface of the medium. 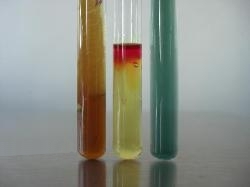 Reaction is negative if red color does not appear. degrade indole and a false negative result may occur. production may produce a false negative result or the reaction may be weak. as it is produced; therefore, false negative reactions may occur.